As a graphic designer and a clinical psychologist I frequently come across individuals who find themselves “overthinking”, and feeling unable to let things go. Many creative people tend to be quite analytical - they like problem solving, looking at things from a new angle, investigating new ideas and analysing the problem until they find that great new thing or until they feel inspired. This type of analytical thinking however, can also lend itself to the feeling of “overthinking”. Which is when we continue to think about a problem or event over and over to the extent that it feels frustrating, upsetting, stressful or anxiety provoking. This overthinking might occur in our professional life; by continually thinking about a new idea, thinking about business strategies, what steps need to taken next, what we might have said to a client we are working with or what difficult customers might have said to us. Or it might be personal issues like why we had a certain fight, why we said something silly or what difficult conversations or confrontations we have to get through later that day. you feel you can’t let go or enjoy yourself because you are thinking too much. Thoughts, feelings and behaviours are all linked. This is something I explain to clients in my psychology practice a lot. Our thoughts effect our feelings, our feelings effect our behaviour, and our behaviour effects our thoughts, and so it goes - in both directions. For example: if I am thinking “it is such a beautiful day today”, then there is a good chance I might feel happy and motivated. And if I am feeling motivated and happy then I might do something active, like go for a walk, see a friend or take some photos. And then that would have a flow on effect to my thinking- I might start thinking about the flowers I see, the birds I hear or the houses I see. Each affects the other. Now what would happen if I started thinking about how difficult my upcoming meeting was going to be? How might this make me feel? Maybe nervous, a bit stressed and concerned? How might this effect my behaviour? There is a good chance I might start to retreat, feel less motivated and less likely to do something positive and instead sit and work through the thinking and try and come up with a solution. Now this isn’t inherently bad, sometimes we need to problem solve, but it becomes more of a problem when it heads toward a downward spiral. For example if we sit and think and problem solve and come up with some ideas then that is great, but if we sit and think, and then feel worried or anxious, and then think things like “I can’t do it” or “this won’t work” or “I don’t know if I am good enough to do this”, and then start feeling deflated, overwhelmed or anxious then we do need to learn to break the cycle. So how do you break the cycle? Well if they are all connected you only need to change one part of the cycle to affect the whole. The easiest way to do this is to change the behaviour. Sometimes easier said then done (as most psychology techniques are), but essentially all you need to do is a different behaviour. This could be making a cup of tea, going for a walk, watching something funny or engaging, reading a book, having a nice bath or doing some yoga. Basically some type of other behaviour, besides sitting and thinking, to help re-engage your brain and shift the cycle to something more positive. Some people worry that distraction is not helpful. They think they need to immerse themselves in the problem to get anywhere. You don’t, and there is nothing wrong with distraction. Like anything, it is all a balancing act. If all you ever did was distract yourself then yes that would be a problem. If you got no work done, no study or nothing productive because you kept trying to distract then that would no longer be useful. But if you are distracting to give yourself a break, to ease your mind and break the downward spiral that overthinking can cause, then it is useful and helpful. So what do you find distracting? Maybe it is one of the ideas mentioned above, or in my blog on self care (here). Maybe it is doing some different work for a while? Writing a new blog that is different to what you are working on? The point is that if you feel yourself sliding in to overthinking or starting to feel down by it, then allow yourself to distract and feel assured in the knowledge that this is not a bad strategy at all, but one that is useful and necessary in order to be productive. Women, more then men, like to talk out their problems. It feels like it helps, to vent it all out and to hear someone else's perspective. Definitely this can help. As a psychologist who talks to people all the time about their issues, I know that this helps - it has been scientifically shown to do so. But like anything, it needs to be in balance. Talking about our problems or stressors too much can simply continue the brain to focus on these issues, and sometimes it can make them seem even bigger then they are. Or it can make people feel frustrated and even more upset if they don’t receive the response they were hoping for from someone else. It can instead then increase feelings of anxiety or stress. So instead why not trying writing your worries or concerns down? 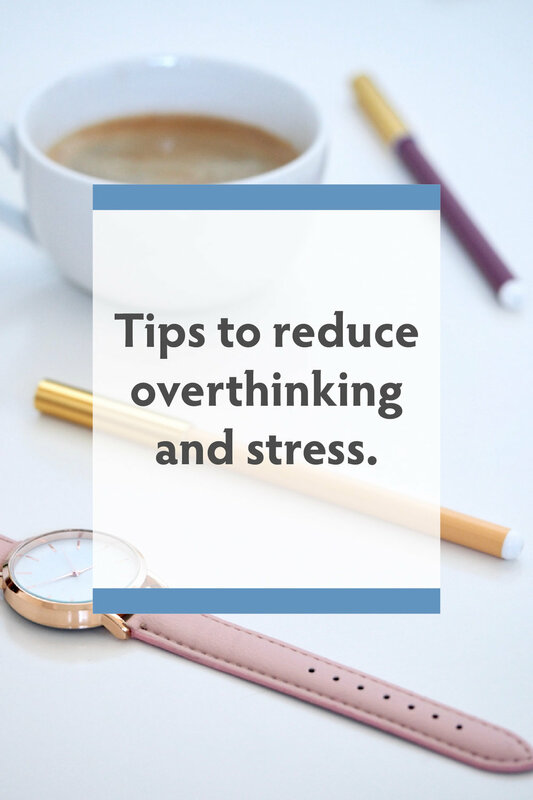 This can help by allowing you space to think about the problem, and to get it off your chest, but then you can also feel a sense of achievement in having written it down, and can then move on to distraction or behavioural changes to let it go. Journal writing has been shown in psychological research to help alleviate negative mood and help limit overthinking (you can read a journal article about it here: https://www.ncbi.nlm.nih.gov/pmc/articles/PMC3759583/ or read an overview here: https://psychcentral.com/lib/the-health-benefits-of-journaling/). Another way to help learn to break the cycle of overthinking is to structure yourself and have a plan. Here is a break down of how to shift your thought cycle. Ask yourself - can I do something about it? If it is a problem that you can something about, that you can plan or take action on then answer yes, if you can’t do anything about it (especially if it is something from the past) then focus on letting it go. Come back to your behavioural changes to help your mind to put this in the past. If you can do something about it, then can you do it now? If you can - then do it! The best way to stop thinking about it is to just get it done. But perhaps you can’t do it now. A really common time to overthink and get stressed out when we can’t do anything about it, is right before going to bed. I hear my clients talk about this all the time. This is a harder time to learn to let it go because it is not the time to get outside, to meet with people or call them on the phone. There is often little to no stimulation in the environment as we are often still, lying in the dark, so the brain goes haywire. This is a good time to plan. Come up with a reliable way to make sure you can do it later. Don’t just rely on your brain remembering for you- as this is what causes stress, thinking “I can’t forget this” is not very restful. Most people have their phones in their room - can you set an alarm or reminder for tomorrow to sit and brainstorm? Or perhaps have a notepad next to your bed for this purpose. If it is something you can’t do at that moment, or you need to do some work to make it happen (like write a budget or plan how to run a meeting), then plan when you are doing to do those tasks, and set yourself a deadline- like “I will do this at 3pm tomorrow”. When you plan what you are going to do, and set yourself a reliable reminder, then our brain is better at letting it go because it knows we don’t have to hold on to it in order to remember. Use this thought diagram. Chances are you will get to the let it go step, you will practice your different behaviour, and then you will slip in to thinking about it again. Don’t worry! This is totally normal. It takes practice. Learning not to overthink is a skill, like anything else. Anything that we learn in our brain takes time, and at first feels hard. Imagine you were learning guitar, or a new language, would you expect to get it straight away? No, you know it takes practice and at first often feels frustrating and difficult. But in time you can get there. Honestly you can. Not only have I seen this work time and again with clients in my psychology practice, I have also worked on this myself. Being a creative person, and a psychologist, I have the overthinking trait too! But I have really worked on this, and managed to lessen it a lot. Difficult situations will always arise, that’s part of the richness of life. If everything was easy it would get boring. We need challenges and we learn really well from them. And sometimes we need to think a lot about our problems and difficulties in order to problem solve them or come up with solutions. Analysing situations is really good, and can lead to more creativity, problem solving and deeper insight in to ourselves. However when it starts to feel like “overthinking” it stops being so useful. When it feels like we can’t relax or get away from the thoughts, that’s when we need to learn how to let go and reduce the overthinking. Do you struggle with overthinking or analysing things? Have you found anything not listed here that really helps? Let us know below! Newer PostWhy you need to be using this awesome colour picker tool for your designs. Older Post7 Reasons you need a website and not just a Facebook business page.